If you dropped by our booth at EGX Rezzed this weekend, thank you—we had a blast! This was State Machine’s first trip out in public. We had lots of questions going in: how would everyone find the game? What connections would people draw? Would the weirder stuff click for people? And after going through five or six different openings to the game, does this one work? Our demo covered the whole first section of the game, so it was a little long! 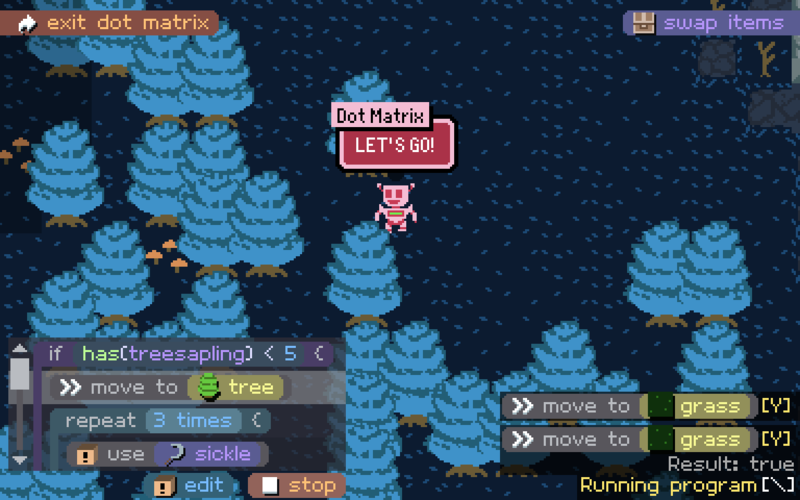 State Machine’s a complex game and we wanted to show off the big stuff. Right now the core of it is getting the island moving again by running several factories, which you can do by recruiting robots and giving them detailed orders. It’s all about getting these cute systems working together, so it’s a kind of game that can easily miss the mark when you tackle it all at once. Thankfully, our approach was a huge success! 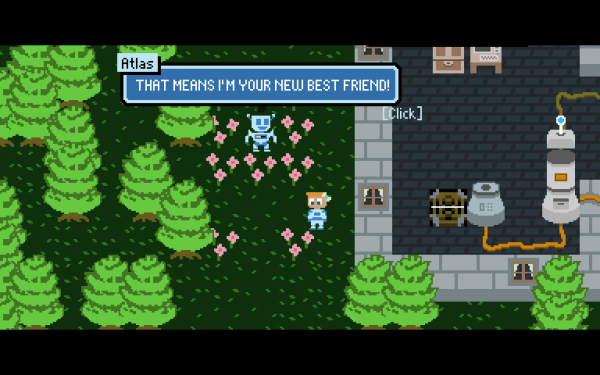 Players loved the game (even the dumb jokes we put in as surprises). We’ve had it compared to an RPG, an RTS and the Sims, of all things. We learned a lot about making the opening fun, and we even made some fixes during the show—after which almost everyone got a few factories running. That gives us loads of confidence to take this further! Generals always fight the last battle, right? I’ve noticed this is often true of people’s creative work. We sketch out territory in one project and map it further in the next. Or perhaps we fence round the territory we’ve seen and colour in the negative space—the gaps left by the last project’s outline. This is how our individual games connect into bodies of work, dots into lines, and how our central themes begin to emerge. 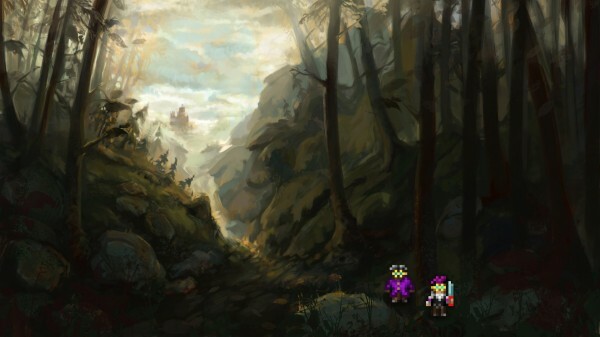 Cardinal Quest 2 was my reaction to the 15-minute playtime games I’d done before. I wanted to make something players could zone into for hours; something big enough to feel like a real commercial game worth money. That is, a commercial indie game in 2010/2011: the era of Amnesia and Recettear and Desktop Dungeons and the Minecraft alpha. That seemed like a high bar but what the heck, right? It’s been a while! Since the last patch, y’all have sent me a number of bug reports and balance notes to sift through. Most of my time right now is going on the Secret Project, but I’d like to keep CQ2 nice and shiny—so here we go! Here’s an mini-update based on those notes, fixing the main bugs and updating some of the weaker spots on classes that I felt needed the help. The Wizard’s “Enslave” skill is one of these. I’ve changed it to recharge over time when you don’t have an Enslaved minion instead of using XP. This is a big change and makes Enslave way more consistent, but I think this is OK; the Wizard was perhaps a little weak, and the strength of the Ice Blast talent means this will largely add options for alternate builds. Pugilist “Chi Mastery” is another. The Pugilist’s talents are tough to balance, since they also have to cover the stat and damage boosts that Weapons provide in other classes. I’ve upgraded most of the Pugilist’s talents to compensate for this, but the healing path was lagging behind. Now, Chi Mastery is an active boost to Uppercut/Headbutt that you can control to get extra health when you need it. It’s a major boost and I’m hoping it’ll get ridiculously out of control in the Tower! The update’s live on Kongregate and Steam now. itch.io, iOS and Android will follow in the next few days. Watch the version number on the menu or check back soon, I’ll update when they’re live! Ever since The Tower was introduced in 1.1, it’s been crazy popular. In many ways it’s Cardinal Quest 2’s endgame, something to tackle beyond clearing the Acts and racing up the ranks of the achievement system. I’m super proud of how well the Tower’s worked out—but I feel there’s lots of room to do better, especially in level variety. This patch is the first step on that path. As you reach boss levels, you’ll find there are a few new layouts to tackle. A few bosses even have their own special levels. I hope you’ll find them appropriately terrifying! I’ve fixed lots of bugs! I’ve fixed allies starting in treasure closets on 1-7. I’ve fixed a thing where poision could get past Antivenom for half a turn before it caught up. I’ve fixed Wisps crashing the game if two if them kill the same enemy at the same time. I’ve fixed items sometimes spawning invisibly a while after an invisible enemy dies, which was a weird one. 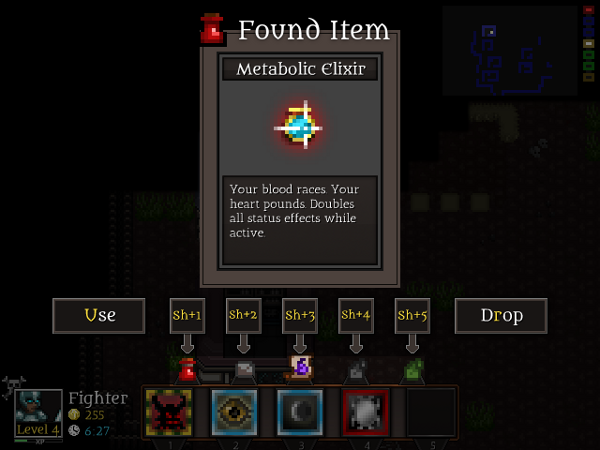 I’ve fixed a bug on iOS and Android that could permanently destroy the item you were looking at if you switched app while the “Found Item” screen was up. I’m going to take a few more days for fun things. Patch 1.18 will be up on Steam and Kongregate before the weekend, then iOS and Android soon after. As I write this I’m mainlining liquid paracetamol to keep this cold in check. I’ve been ill three times this year so far? That’s what I get for going outside and collaborating with humans but it’s totally worth it and I’m optimistic my immune system will catch up to 2016 eventually. The new project with Terry is going well, a wonderful mess of survival and learning to program, and I’m excited to to get to the point where we can show off more as it comes together. I’m not too familiar with survival games though, so I’m trying to play more and get to know them. 🙂 What are your favourites? I can’t summarise 2015 easily. It’s a leaky thing, feeding on 2014 and trailing threads into 2016. It doesn’t separate cleanly. I started work on this game in 2012. That’s four years ago! I’ve been on it full-time since then. In 2014 I released the game on Kongregate, iOS and Android. Tens of thousands of people played it and liked it. The next step was to build the Steam version, in between cool updates for everyone playing it already. Update-wise, the big thing last year was The Tower. I had major reservations about building an endless mode, I don’t usually like ’em, but I feel it’s come out well and lots of people seem to like it more than the main Acts. As for Steam: I was determined to get this out before the end of the year and we just made it, releasing days before the start of Steam’s big end-of-year sales. So CQ2 is now done. It feels strange to say that after focusing on one thing for so long! I can make cool updates when I feel like it, and I will, but there are no more milestones to hit. I can do other things. That’s liberating and a little scary. So in 2015, I finished a game. I feel like I should have been able to do more, though. Maybe everyone feels that? Twelve months ago I was recovering from burnout. I still am. It’s an ongoing process, though I’m excited about working on new things again. I’ve got into regular exercise, three times a week. That’s helping with a lot of things, including sleep. Sleeping right, when it happens, helps with much more. I’ve discovered you can play games on an exercise bike, which deals with the boredom, but the game needs to have the right tempo or it all goes wrong. I’ve discovered that METAL GEAR SOLID V doesn’t have the right tempo. 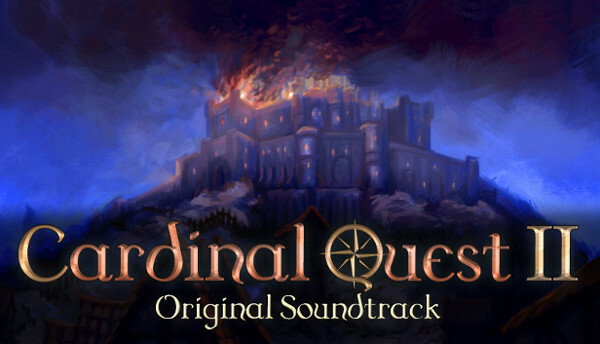 Cardinal Quest 2’s soundtrack is now up on Steam! It’s available as DLC for the game; there’s also a game + DLC bundle. They’re both at 40% off until the end of the Steam sale on Monday. These should be going live next week, so I’ll post a few more soon—as I figure out what updates I’ll add to CQ2 next, and what my next game’s going to be for 2016. Happy new year!